It called Temple of the Three Windows to a set of enclosures, arranged around a square courtyard. Protrudes, a polygonal wall, with three trapezoidal windows. These windows unadorned, rocks that make up the wall, they are embedded, perfectly and symmetrically. There is evidence today that the wall has three windows, probably had 5 windows and also this place was covered. 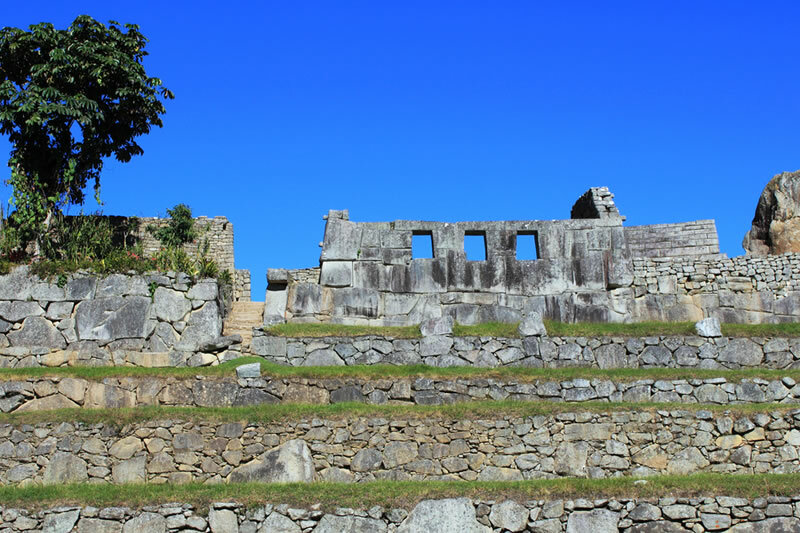 The Temple of the 3 Windows are located in the area of "Hanan" or uptown; It is the most important part of Machu Picchu, because it is the religious sector is northeast of the city Inca. This solid is oriented facing south, towards the Huayna Picchu and Putucusi. Has been linked, this construction with the legend of "Tamputoq’o" which speaks of the foundation of the Inca state, by the Ayar brothers, each window represent, three tribes, who gave mythologically, origin to the Incas, but this historical fact, has not yet been studied. When excavations were made by Bingham, at the height of the windows to 3 feet deep at the back, lots of pots and liturgical objects, cups, jars and decorated sources, were found; so probably religious ceremonies were performed, with these objects in the Temple of the Three Windows, which in turn is made up of other facilities, also for ceremonial use.